Have you heard of the FX modifier? 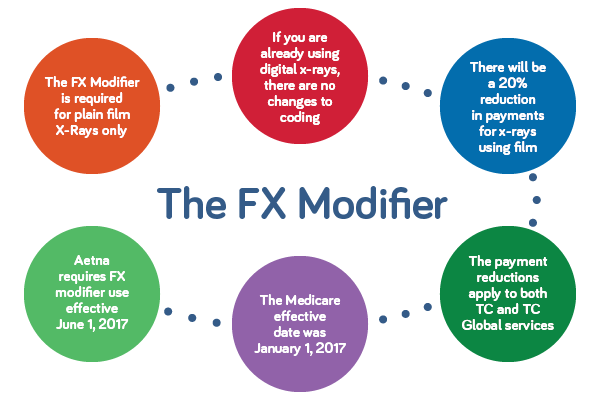 On January 1, 2017, the Centers for Medicare and Medicaid Services (CMS) implemented the required use of this modifier when radiology services are provided via plain film, vs. digital. For example, when two views of the cervical spine are taken, the modifier is appended to the x-ray code, like this 72040-FX. The modifier is a pricing modifier, which means a reduction of 20% off the technical component of the films if plain films are taken. If you take digital films, no change to coding is necessary, as this reduction doesn’t apply. If a Medicare beneficiary asks you to submit your bill for x-rays, you must include the FX modifier if the x-rays were taken on plain films. Of course, Medicare doesn’t reimburse for x-rays when ordered or taken by chiropractors, but as the saying goes: As Medicare goes, so goes the nation. Effective June 1, 2017, Aetna requires an FX Modifier when billing plain film x-rays. Other carriers will likely follow suit.